AfriLean offers 5 different LEAN Sales workshops designed to enhance the sales process by linking LEAN principles and systems to the 5 step sales approach. The result is a customer centric sales process, which focuses on greater efficiency and the continuous improvement of customer value. This customer centric approach eliminates waste both for the customer and the company through value stream mapping. Sales teams will develop their own ‘best operating practices’ using processes and systems built specifically around their product offering, customer base and sales area. 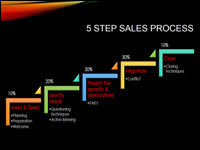 Our most effective program in delivering quick returns is our 90 Day Sales Plan.